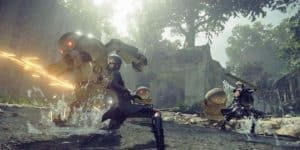 NieR: Automata PC Release Date Confirmed | Nerd Much? NieR: Automata was developed by Platinum Games Inc. and published by Square Enix, and blows it’s predecessor, NieR, completely out of the water. Everything in the game from color design to gameplay has been praised, averaging a score 94 on Metacritic. The especially particular color design is what really catches your eye while playing in this “machine-driven dystopia abandoned by humankind and overrun by machine lifeforms.” This is reflected beautifully in the red of an enemy’s eye against an otherwise grey background, or the unsaturated amusement park of times gone past. All to be explored as you follow androids 2B, 9S, and A2.